In such condition, there is no place for industry; because the fruit thereof is uncertain: and consequently no culture of the earth; no navigation, nor use of the commodities that may be imported by sea; no commodious building; no instruments of moving, and removing, such things as require much force; no knowledge of the face of the earth; no account of time; no arts; no letters; no society; and which is worst of all, continual fear, and danger of violent death; and the life of man, solitary, poor, nasty, brutish, and short. Leviathan, CH XIII. The Great Forgetting, an idea first suggested by Daniel Quinn in The Story of B, represents a collective loss of knowledge about the natural history of humanity. 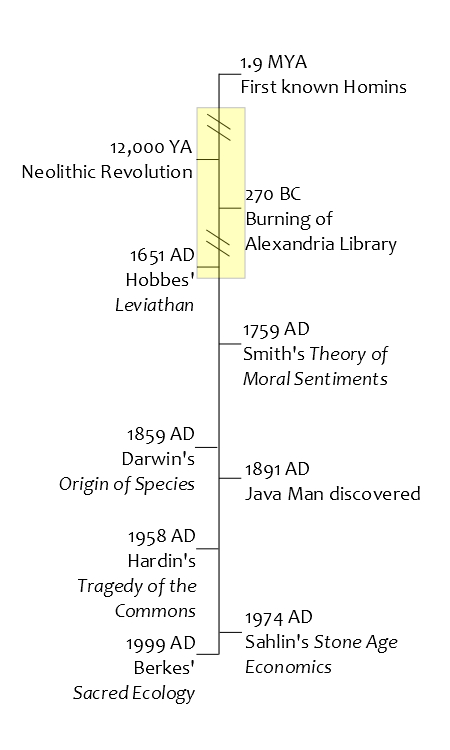 Knowledge of prehistory did not begin to emerge until centuries after Hobbes and Smith. Unbeknownst to Hobbes, however, was that the natural history of humanity spans longer than a few thousand years, many hundreds of thousands of years longer. Homo Sapiens and related hominins lived in complex social groups for at least 500,000 years, and all of the aspects of culture that Hobbes notes: cultivation, navigation, trade, sophisticated geographical and ecological knowledge, the arts, and rich traditions of complex storytelling have all been extensively documented in various parts of the world. In his book Stone Age Economics, anthropologist Marshal Sahlins describes prehistoric cultures as "the original affluent societies," and supports this label with detailed economic arguments that display an elegance and efficiency to hunting and gathering systems that is not mirrored in contemporary civilization's industrialized modes of production. However, in order for knowledge of this "prehistory" to have been preserved it would have to have been passed down, first orally and then in the written record, for thousands of years, throughout the unfolding of civilization and the agricultural revolution (the yellow box in the figure to the right). In other words, this history would have to have been preserved and retold by the people and scholars of cultures that were fundamentally, ideologically hostile to these"primitive" origins. Of course, knowledge of this history, of the way humans lived prior to civilization and "since time immemorial" was lost only to the people of civilization. Countless tribal peoples continued to thrive all over the world, or at least until civilized cultures usurped their territory and forced them to change in the name of progress. Many Indigenous peoples continue to assert the wisdom and relevance of tribalism and Indigenous world views today. Recognition of this "Great Forgetting" mandates that we revisit the entire body of social and moral philosophy that was built on this error. Rational actor theory, game theory, the tragedy of the commons, and many of the world's religions are all premised to some extent on an incorrect beliefs about human origins and human nature--specifically that humans are inherently flawed, vicious, and self-interested. That we haven't revisited these precepts already is a testament to how durable the story of civilization is in the western world view. Even the tragedy of the commons persists as a verdant cultural myth in western society despite the extensive empirical evidence presented by Elinor Ostrom and numerous other scholars that this pattern of behavior is not a state of nature but an anomaly and perhaps even a trapping of civilization itself. In the last two decades there has been a resurgence of interest in alternative and Native ways of knowing, in response perhaps to the increasing body of evidence that civilization as a social ideal is inherently unjust and unsustainable. The now widespread acceptance in science and conservation practice of Indigenous Ecological Knowledge as valid and useful is a testament to this turn. "The Great Remembering", then, is this idea that there is still hope for humanity to recapture and benefit from some basic understandings of our human nature and our largely sustainable tribal origins. We are not broken by design. Some argue that these sentiments are naive and fetishistic of Indigeneity. Yet, there is nothing in these arguments that suggests or is predicated upon Indigenous cultures being perfect; some practiced (at times) unsustainable hunting practices, others were marked with severe gender inequity. Other critics would dismiss the relevance of wisdom from our tribal, hunting and gathering past by conflating it with the (ridiculous) implication that humanity should somehow "go back" to hunting and gathering. The idea is not to go back. The idea is to look at what worked in the past and use this as guidance on how to move forward. This website is my attempt to distill some of this wisdom from our tribal origins into a practicable philosophy for the future.